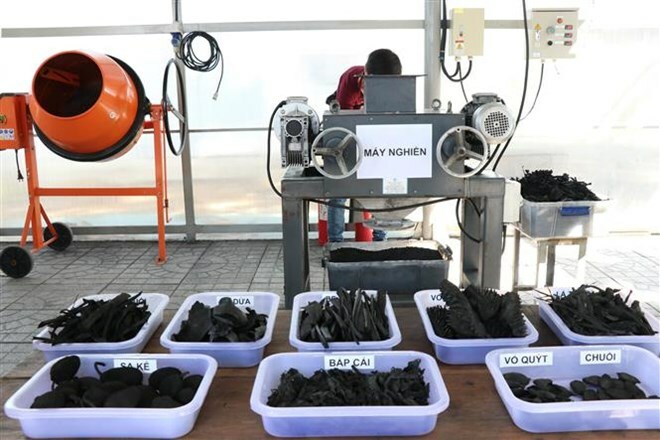 HCM City (VNA) – A workshop introducing Japan’s advanced organic waste processing technology was held at an experimental laboratory of the Saigon Innovation Hub (SIHUB) in Ho Chi Minh City on March 28. The event was jointly held by the SIHUB and MILAI Group, a Japanese technology research and development company. The closed-loop organic waste treatment technology is designed specifically to not emit carbon dioxide (CO2) during the process from waste collection to electricity generation. Chairman of the MILAI Group Ichiro Hatayama said the group’s 6R organic waste processing technology could be effectively applied in Vietnam, using electric vehicles to collect waste instead of the current trucks running on diesel. The waste would then be dried, carbonised, and gasified to be used by gas engines to generate power. The electricity would be used to charge the vehicles, forming a closed loop with no CO2 emissions, Hatayama explained, noting that fertilisers can also be created through the process. The technology also offers greater flexibility by allowing a wide range of productivity ranges (from 100 kg to 25 tonnes per machine every day), and can be used in a wide variety of locations in rural or urban areas, he added. A representative of SIHUB said that it has carried out various improvements for the application of this technology in Vietnam.